Our man's lowdown on the Olympics 2012 showdown. The rivals for the 2012 Olympics brought out the heavy artillery on Tuesday in a final effort to grab the headlines on the eve of the big vote. The world's media got the chance to meet Hillary Clinton and Tony Blair within an hour of finishing their breakfast, and Spanish Prime Minister Jose Luis Rodriguez Zapatero had his turn in the afternoon. 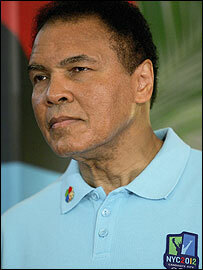 French President Jacques Chirac jetted in, boxing legend Muhammad Ali did a photocall and Russia finally broke its silence. Oh, and David Beckham came out into the open to lobby for his 'manor'. Prop: US senator Hillary Clinton's hair. Extremely impressive. First to step up to the plate was Mrs Clinton, who gave a polished display despite having just flown in on the redeye. The wife of former US President Bill Clinton admitted she had started chatting to IOC members even before she had taken her first mouthful of breakfast. And her hair was perfect as she pushed New York's key messages, saying living in the Big Apple was like "living in an Olympic village". Behind her, Olympic legends Nadia Comaneci and Bob Beamon stood to attention with their fellow bid ambassadors. 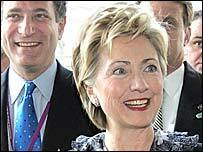 Reporters were kept inside at the end until Mrs Clinton had left the building, and then it was straight off to the first of London's two briefings. Prop: Basketball player Amber Charles, 14, who will feature in London's bid presentation. 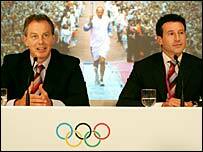 Not to be outdone by their stateside rivals, London also unleashed a political heavyweight as British Prime Minister Tony Blair took to the stage with bid leader Lord Coe. Fourteen-year-old basketball starlet Amber Charles was also there as it was announced she would join Coe on stage for London's final presentation. Blair kicked off by making a joke about his lack of basketball prowess as a youngster, before launching into a passionate explanation of how much a London Olympics could change the world. But the Prime Minister's failure to respond to recent disparaging comments attributed to the French President and bid rival Jacques Chirac denied the media a more juicy story. David Beckham's arrival later on provided something to distract them. Prop: Van used to whisk journalists away to Madrid's news conference. The sparse attendance at Moscow's first and only briefing reflected its billing as the rank outsider - or perhaps the fact the media had to walk further than 50 yards to get to the venue. No-nonsense Mayor Yuri Luzhkov eyed the audience sternly as his deputy Valery Shantsev suggested the western media had been criticising the bid because they knew it was the strongest and wanted to bring it down. And eyebrows were raised when a woman saying she was from Atlanta and sitting in the front row said it was an honour to address the mayor and that she believed Moscow was the "clear choice", before asking an innocuous question. But the highlight came when Svatkovsky turned to Moscow's blonde press officer and announced: "I would like to congratulate our beautiful woman - it's her birthday today." Having received a kiss on the cheek from bid director Alexander Chernov, she signed off the conference with a cheery "see you in Moscow in 2012". Best quote: "I think people have been surprised by the strength of our bid." Having lined up no less than nine team members on Monday, Madrid went one better this time. They also showed they had learned from their mistakes by providing headsets, halving the time needed to answer each question. Prime minister Zapatero attracted a scrum of photographers as he walked into the ballroom at the famous Raffles Hotel, and part of a chandelier was dismantled as a clumsy cameraman tried to get closer to the action. Former tennis star Arantxa Sanchez Vicario said her bit for the bid and Juan Antonio Samaranch Jr, son of the former IOC president, was also in attendance. Prop: Mayor Bertrand Delanoe is keeping his relay baton with him for good luck. Much of the Paris day was spent in rehearsals for the potentially crucial final bid presentation. But there was plenty of airport duty as Chirac and a host of sporting ambassadors flew in for the big day. Will Mr Chirac eat his words? Chirac did a photocall but said little, having arrived in the wake of disparaging comments attributed to him about Britain in a French newspaper. But World Cup-winning football captain Laurent Blanc, NBA star Tony Parker and three-time gold medallist Marie Jose Perec were among those on duty to talk up the bid. Prop: None needed. A legend was in the house. Perhaps the warmest welcome in Singapore was reserved for Rome 1960 heavyweight boxing champion Ali. The 63-year-old New York bid ambassador, who has Parkinson's disease, did not speak during his appearance with mayor Bloomberg. But he was given a standing ovation at a special-photo call, and Bloomberg called him "a true hero to all of us". Prop: Busload of children for bid presentation. Beckham was wisely ushered in through the back door of the Carlton Hotel to avoid an unseemly free-for-all with camera crews and photographers. But the flash bulbs started going off and the shutters clicking as soon as he walked into the room, with the Asian media much more prominent than at previous briefings. The eight other sporting ambassadors sitting beside him, all in identical bid suits, boasted more gold medals between them than Becks has tattoos. But most of the questions were for the England football captain, and the bid's press team were not amused when one journalist pointed it out as he asked a question. Beckham fielded them all well, although there were some confused expressions in the audience when the wording of one answer gave the impression that his favourite Olympic memories included watching Lord Coe running barefoot.